1. Maybe this is just another fad. How well it is done will determine that. 2. But the results themselves (conditions of well-being for children, adults, families and communities) are here to stay. Results like “all children healthy and ready for school” will still be important in 100 years. 4. The notion of using data to gauge our success has been part of almost all successful enterprises in the past. It is here to stay in work on population well-being and program performance. 5. 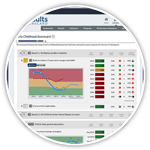 One of the biggest differences is the clear distinction between community accountability for population results vs. manager accountability for program client results. These have been badly mixed up in the past. Without making this distinction clear, we make managers think that their program is a failure unless they can demonstrate a measurable impact on population well-being. It is rare that any one program can do this. This same thinking leads to the mistake of assigning responsibility for population change to just one agency (e.g. the Public Health Director is responsible for “healthy children”) when we know this result can not be accomplished without the work of many public and private sector partners. 6. The performance measurement framework discussed in this guide breaks with past work in a number of ways. It skips weeks, months, sometime years of analysis, flow charts, program descriptions and other “preparation,” and goes directly to the identification of performance measures. Most people know their program well enough to identify performance measures right away without a lot of preliminaries. It starts by sorting the program’s performance measures into three common sense plain English categories (How much did we do? How well did we do it? Is anyone better off?). This is the simplest (and yet complete) system of categorizing performance measures available. Then, starting with the data you have, the most important 3 to 5 “headline” performance measures are chosen. These measures are then used in a disciplined process to engage partners and get from talk to the actions necessary to improve performance. The entire process is summarized in 7 questions, and a first pass can be accomplished in about about an hour, not weeks months or years. Every iteration of the 7 questions improves the action plan. 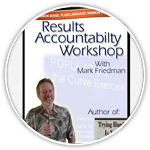 Results-Based Accountability could be a fad. But population results and client results are here to stay. Healthy children or safe communities will be just as important 50 years from now as today. Programs which improve the lives of their clients in measurable ways will be valued above others as long as programs exist. So the foundation of the work – the notion of well being in plain language and then in measurable terms – is, almost certainly, enduring. For these very same reasons, Results-Based Accountability is not new. There have been many past efforts which attempt to structure our thinking, planning, budgeting and management processes around getting results. These are some of the reasons why Results-Based Accountability in some form is here to stay. What is different about this particular approach? (1) Not just any approach: First, the approach discussed in this paper is not just any approach which happens to use the words “result,” “outcome” or “performance measure,” but a specific coherent framework articulated in a series of papers over a 5 year period by the Center for the Study of Social Policy, The Finance Project, The Foundation Consortium and the UCLA Center for Healthier Children, Families and Communities. (See references.) If you look at the entire body of work on population and performance accountability you will find that they use different words but the underlying concepts are convergent with this framework (See cross walk: Answer 1.8). (4) The framework clearly distinguishes population accountability from program or agency accountability. These are two profoundly different types of accountability that often get mixed up together. This framework treats them separately, for a very simple reason. Accountability for population well-being can not be pinned on any one person or organization. (The health of all children in the County is not the sole responsibility of the county, the state, the federal government or any of the many public and private partners who have a role to play. It is by definition a shared responsibility. Program and agency accountability, on the other hand, can be assigned to the manager of the program or agency. (6) Breaks with the past on the relationship between population and program accountability. The relationship between population and program accountability is not linear. This may sound like an arcane technicality, but it is a profound break with the past. In most previous efforts (and many current efforts), there is a continuous progression from population well-being to agency and program performance. For example, “Healthy children” flows seamlessly (in a single line) to the Health Department and down to its various programs like childhood immunization. In the Results-Based Accountability framework, there is a break after the population in the ?chain of responsibility.? No one agency is responsible for any population result. Imagine many lines connecting Healthy children to all of the public and private agencies and partners. (7) Instead of treating accountability as just one seamless continuum from population to programs, we treat population and programs, in this framework, as the two profoundly different things they are. For those of you with an interest in the history of this work, this last point is worth emphasizing. We develop each (population and performance accountability) and describe about how they are different but connected. This is in fact true to the way the world really works. There are individuals who are solely accountable for programs and agencies. There are not individuals solely accountable for any aspect of population well-being, whether its the environment the economy or the well-being of children and families. So Results-Based Accountability, as crafted here, and as distinct from performance accountability, is arguably an antidote for the continual erosion of our sense of collective responsibility. (8) Past work on performance measurement has often created thousands of pages of useless paper and wasted untold hours of time. 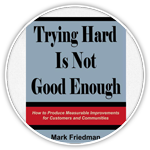 “If it’s not useful to managers, don’t do it.” The performance measurement framework discussed in this guide breaks with past work in a number of ways. It skips mission vision values goals objectives and goes directly to the identification of performance measures. (The useful parts of mission vision and values can be done later) Most people know their program well enough to identify performance measures right away without weeks or months of preliminaries. The process sorts the measures into common sense categories based on the quantity and quality of effort and effect. (How much did we do? How well did we do it? Is anyone better off?). The process does not allow the excuse “I don’t have any data.” It starts with the data you have and identifies a data development agenda to get better in the future. The 3 to 5 most important “headline” performance measures are chosen from those currently available based on their power to communicate with stakeholders and how well they get at the heart of the program. These measures are then used in a disciplined process to engage partners, identify what works to improve performance and get from talk to action. The entire process is summarized in 7 questions, and a first pass at it can be accomplished in about an hour, not weeks months or years. Every iteration of the 7 questions improves the action plan. And it’s simple enough that it can be used at every intersection of a supervisor and subordinate throughout the system. Instead of thousands of pages of useless paper you have new tools for managers to use to run their programs, that link readily to budget development and public accountability processes.